It was two years ago that zombies broke a window at Depth of Field Yarn on Cedar Avenue in Minneapolis. 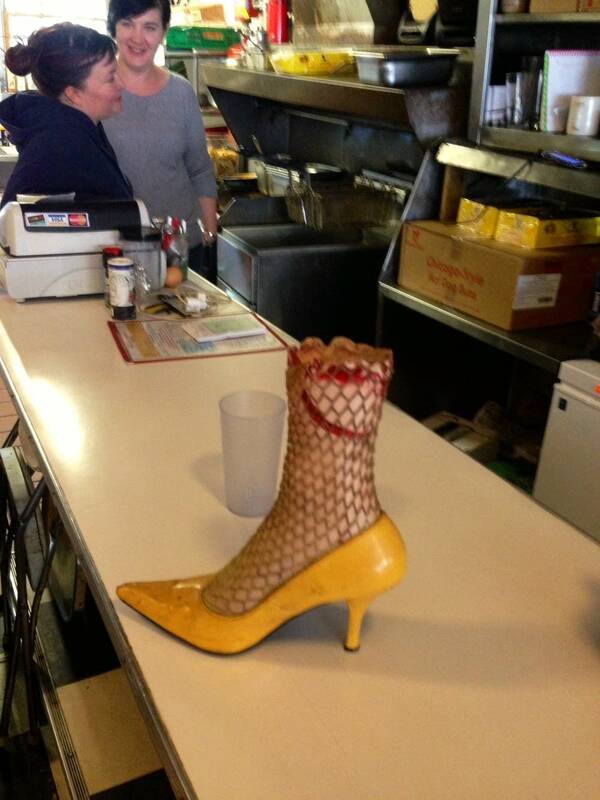 "My husband was called down here in the middle of the night because the alarm went off," said owner Christine Benson. "It was really annoying." The broken window happened during the annual Zombie Pub Crawl, where participants dress, talk and act like movie zombies, with one exception: Pub-crawling zombies have a taste for booze instead of brains. 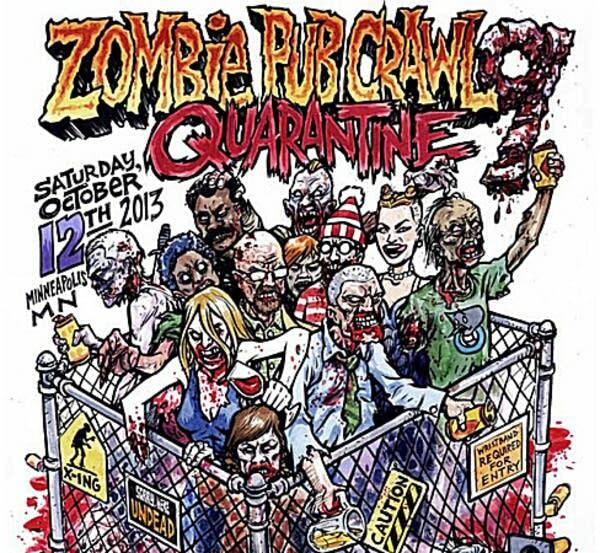 In its ninth year, the Zombie Pub Crawl has grown from a scrappy DIY effort organized by a few friends to a sprawling event that's expected to bring about 30,000 people to the Cedar-Riverside neighborhood of Minneapolis on Saturday. That's a good thing for bars. But not everyone welcomes those playing undead. Organizers defend a unique event in Minneapolis. They say they're beefing up security and trying to help locals who experience problems. For the third year in a row, the Hard Times Cafe on Riverside Avenue, usually open 22 hours a day, will close its doors to avoid the zombies. Hard Times Cafe collective member Anna Lohse said the cafe has not made money on zombie crawl nights. "People come in and they're drunk and they don't buy much and they just sit around and they drip fake blood everywhere," Lohse said. "They cause a ruckus and they cause damage and they stain our floors and they make customers feel really uncomfortable." Lohse thinks most of the zombies have little incentive to respect the neighborhood because they don't live or work there. "People are going up to windows of businesses, just hitting them, shaking them," Lohse said. "One of my coworkers just described it as a war zone -- I was biking through two years ago and I had beer bottles just thrown at me." Sarah Fearing, a worker at The Wienery on Cedar Avenue, said the cafe's owner loves the event because it's good for business but that some people in costumes act "crazy, out of control." Last year, another window was broken at nearby Midwest Mountaineering by a crowd of zombies. Co-organizer Taylor Carik doesn't gloss over the bad things that can happen when you cram tens of thousands of people acting like zombies into a restricted area. "Logistically for a smaller neighborhood like that, there are also some challenges with it," Carik said. "It's a lot of people and they party really hard and it gets to be pretty messy." But since the event filed as an official business three years ago, Carik said organizers have tried to be more civic-minded. Carik said the non-profit sponsor of their liquor license is the West Bank Business Association. The executive director of the business association could not be reached for comment. Carik said organizers have tried to mitigate any negative impacts caused by the event. He said the pub crawl paid for the broken windows at Depth of Field and Midwest Mountaineering, as they've paid for others over the years. They've also added extra security this year. Carik said they'll pay for 95 Minneapolis police officers, 125 private security guards and 150 volunteers who donate their time on behalf of a non-profit that benefits from pub crawl donations. The pub crawl is even paying for a private security guard to be posted outside a comics shop on Washington Avenue that's a frequent zombie target: Big Brain Comics. Benson of Depth of Field Yarn has noticed that security is tighter at the event since her window was broken. But she said the Zombie Pub Crawl, whose website lists a dozen commercial sponsors including Southern Comfort and Chipotle, just doesn't fit the character of the neighborhood. "The people who are sponsoring it are apparently trying to do more but what they're doing is trying to get a bigger crowd so everyone gets more money, more profits," Benson said. "It's just more of a hassle for people who live here and people who work here." While Carik wouldn't disclose the event's budget, he said it's in the hundreds of thousands of dollars. He said they aren't making huge amounts of money on the event, but that the five main co-organizers expect to make enough money to adequately compensate them for their time and cover the overhead, which includes $20,000 for a 50-foot-tall inflatable zombie named Phil. He said organizers purposely kept the event in Cedar-Riverside because they like the independent vibe there and want to benefit the businesses. Mohamed Omar, a worker at Otanga Grocery on Cedar Avenue, said his customers are now accustomed to the yearly zombie invasion, but that closing off the streets makes it very difficult for anyone to get to the store. "It really bothers us a lot at this business," Omar said. "The whole day, customers who are coming through here, they can't come here because there's no place to park, you can't come through the street." Carik acknowledges that the event might inconvenience some. He said organizers have partnered with the nearby Brian Coyle Center to support a program that provides work for neighborhood youth. He said the pub crawl is open to any suggestions that would make the event less of a burden on residents. Not all the non-bar businesses in the area are upset about the event. Ali Ali, manager of Wadajir Grocery and Halal Meat on Cedar Avenue said the store does good business during Zombie Pub Crawl. "I personally enjoy it, I stand out here and just watch them do what they do," Ali said. "It's hilarious, it's good for business, so we want to have it year after year." Other businesses see the event as a tradeoff. Theatre in the Round canceled a Saturday performance of the play Morning's at Seven. Executive Director Steven Antenucci said the theatre will sacrifice some income due to the cancellation, but that the pub crawl benefits the whole neighborhood. "The visibility, bringing a lot of people in, it's good for the other businesses," Antenucci said. "The more businesses that thrive in the area the better for us." Theatre in the Round decided to go dark for the night largely because it expected zombies to take up the parking that audiences normally use, Antenucci said. "The sidewalks are just packed with zombies lurching back and forth and screaming for brains," Antenucci said. "It's not the kind of crowd that we want an audience who just went to a Tennessee Williams play to try to get through to get to the parking lot." The event this year includes a 6.66K race to benefit Second Harvest Heartland. Runners register as either fleeing humans or chasing zombies.